These 16-page board books are the ideal introduction to the Bible for toddlers, featuring big, bold pictures and super-simple storylines. On every page there are exciting action words that littlies can sound out, and at the end there's a lift-the-flap surprise happy ending. Ages 1-4. 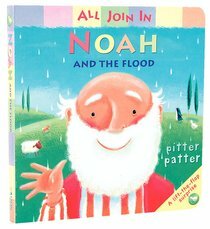 About "Noah and the Flood (All Join In Series)"
Claire Henley has illustrated a number of children's novelty books for publishers including Templar, Ladybird and Macmillan.